ban-plt.org.uk | Lies, damn lies and statistics; and the occasional truths! Ban Power Line Technology Save your radio spectrum! Lies, damn lies and statistics; and the occasional truths! It has taken three years, Freedom of Information Act requests, and a complaint to the Information Commissioner's Office; and finally, Ofcom have been proven to be liars and suppressors of the truth! Radio Amateur and member of the pressure group UKQRM, Peter Walker (G0RSQ), would not take "no" for an answer when Ofcom refused to release the tests results they commissioned to ascertain if the Comtrend PG902 PLT was compliant with the 'EMC Essential Requirements' and the standardised test EN55022:1998. They kept citing "criminal proceedings" and tried their hardest to bury the September 2008 report. Peter took the case to the ICO's Information Tribunal and they ruled that, under the Environmental Information Regulations, Ofcom had no right to withhold the information. This information is now released into the public domain and the results speak volumes: Did Not Comply is written throughout the report. So why is our "Evidence based regulator" ignoring the evidence? This report, and the second report it commissioned from PA Consulting both say that Power Line Technology is not suitable, it destroys the radio spectrum, fails EN55022 and should not be on the market! UKQRM are now asking this of BIS! Ofcom are digging themselves into a larger hole! Ofcom recently released a collection of documentation in an attempt to reinforce their inactive stance on PLT. "Everything is OK. Keep calm and carry on!" Everything is not OK and a little reading by people who have a modicum of intelligence reveals gaping holes in Ofcom's reasoning. For example, this report commission by BT: http://stakeholders.ofcom.org.uk/binaries/enforcement/spectrum-enforcement/PLT/Blackwood_report_from_BT_-_1.PDF has some major problems. They did not carry out the mains port conducted emissions tests; i.e the bit that involves radio. See Note in the test (page 6) "Mains Port Conducted Emissions not performed at request of customer." And page 1 Test Standards: EN 55022:2006 + A1:2007 Telecommunications Port Conducted Emissions & Radiated Emissions only. Telecomms port testing was done at HF. That would pass as it is standard Cat5; i.e "a material substance constructed or arranged for the purpose" - see the WTA page. Radiated emissions were only checked above 30MHz (consistent with EN55022:2006). By leaving out the mains port tests they have passed the parts of the standard that they tested against. This test cannot be considered a valid test against EN55022:2006 as they have only carried out some of the tests required to pass. We would all like to take our cars to the MOT centre and ask them to skip certain tests! telecoms port conducted emissions and radiated emissions tests. nowhere within the document does it make that statement. And to rub salt into the wounds, BT are calling Ofcom liars and suggesting their ERA test results (see above.) are invalid! You can read it for yourself in this BT presentation on BT's own EMC testing. From the IEC's website: "The IEC is the world's leading organization that prepares and publishes International Standards for all electrical, electronic and related technologies — collectively known as electrotechnology. Wherever you find electricity and electronics, you find the IEC supporting safety and performance, the environment, electrical energy efficiency and renewable energies. The IEC also manages conformity assessment systems that certify that equipment, systems or components conform to its International Standards." The IEC utilises working-groups to bring together expertise to help define new standards and testing regimes. The group of interest to us is: CISPR22. They are responsible for attempting to set a standard for Limits and method of measurement of broadband telecommunication equipment over power lines. To date they have circulated several CDs, or Committee Drafts, which if approved, can end up becoming new standards. In the case of PLT, CIS/I/89/CD, CISPR/I/257/CD, and CISPR/I/258/CD have come and gone. Filed in the recycling as completely un-workable without ripping up everything EN55022 stands to protect. The PLT industry is trying as hard as it can to have allowable interference levels raised such that their products can pass EN55022 and pump more radio noise onto the mains wiring. If this pressure succeeds the radio spectrum will be lost forever! IARU Region 1 reports that an EU Parliamentary question on PLT has received an evasive answer from the European Commission. The EUROCOM Working Group introduced a parliamentary question to MEP Birgit Sippel, the sponsor of the exhibition on amateur radio in the European Parliament about a year ago. She forward it to the commission to be answered in written form. Just recently the answer was published, being rather evasive. EUROCOM plans to stick to the topic, trying to get a more precise answer. The Declaration of Conformity for the Comtrend PG902 lists CIS/I/89/CD as a "standard" which the PG902 has been tested against and "conforms" to. CIS/I/89/CD is a Committee Draft, it is not a standard! CIS/I/89/CD has been superseded by CIS/I/257/CD, which has been withdrawn from the Committee as being un-workable. The DoC refers to Technical Construction File identified as XXXXXXX, this is not an acceptable reference on the DoC. 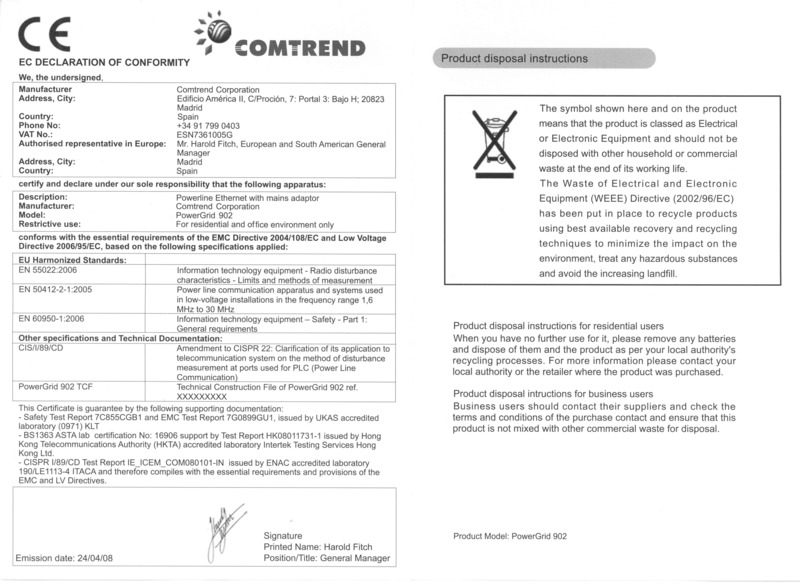 Therefore, the PLT device has an invalid Declaration of Conformity and should not be on the market. Trading Standards should be removing them as "not-fit-for-purpose". Click on the image for a full-size version and marvel at the nonsense! The Declaration of Conformity for the Belkin F5D4076 and the F5D4078 both list a pass of EN55022:2006. This is a little tricky as the F5D4076 failed to pass EN55022:1998! We watched with a great deal of amusement when a Solwise customer purchased a set of their NET-PL-1000M PLT devices and found they wiped out the customer's DAB radio! We would like to draw the readers attention to posts: #44 and #45 from "Steve", the Solwise spokeperson. In post #44, he helpfully lists discredited IEC Committee Drafts, just like the Comtrend DoC above! We will say this again: Committee Drafts are not standards! In post #45, "Steve" wants to assure us that their PLT products meet EN55022:2006. How can they? The PLT lobby have kept EN55022:2006 from being added to the statute books. EN55022:1998 is still in force! And if you have not already seen our tests page, you will see that none of the PLT products pass EN55022:1998; and they will certainly not pass EN55022:2006! This f/w has the Amplitude Map(AMAP) for the MX band modified to "notch out" the frequencies 108 to 137MHz (Aeronautical navigation and Air Traffic control) and 209-230MHz (DAB radio). The HPAV band uses the standard EU AMAP. Includes release notes - uses the standard 1gig utility as supplied on the CD. These changes have been implemented in response to worries raised by a number of UK amateur radio enthusiasts about interference in aeronautical and broadcast bands. They are NOT required by CE or by Ofcom or as part of approval. This is a voluntary f/w modification which users do NOT have to do. Unless you do not want your DAB radio to work, or you live near an ILS equipped airfield and you wish to avoid the wrath of the Civil Aviation Authority! If they do not cause a problem with radio frequency interference, why has Solwise added the notches? Do you have any other hilarious Declaration of Conformity certificates or daft forum posts you would like to share? 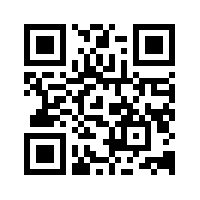 Email us via the link in the menu with a PDF, JPG or PNG. Maplin Electronics (no longer trading) admitted to radio interference! Maplin Electronics seem to be the only supplier of PLT, so far, who are prepared to tell the truth. We received the email below from a member of the UKQRM pressure group. Readers may be at a loss as to why a national electronics chain is prepared to admit to the issues of interference, and at the same time, they are still prepared to sell them?! The "no barrier to free trade" mentioned above seems to apply in this situation, even when devices are shown to have an invalid CE marking by failing the 'essential requirements' of the EMC directive. Unless Ofcom/BIS give clear instructions to Trading Standards, these devices cannot be removed from the market place! Your FAQ Question: Will these products interfere with my radio reception (Shortwave and VHF) ? Yes, this are likely to cause interferance. Maplin Electronics may monitor email traffic data and also the content of email for the purposes of customer service, security, and staff training. Maplin Electronics is a limited company registered in England and Wales. So there you have it. PLT will interfere with your radio!, Oh, the word is "interference"! We received this today from a radio amateur. Maplin are to be commended again for telling the truth, but perhaps they should stop selling PLT, then they would not have to field these questions! useless when I use the homeplugs. reception, this is due to the technology used within the items. Do you have any suppliers of PLT who are telling the truth? We would love to hear about them. Please use the email link to send us the details. We will of course redact your personal information.